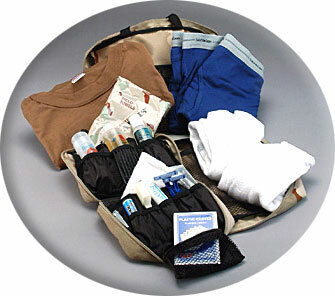 1 Personal Comfort Kit (containing 16 personal hygiene items. This is the kit we sell individually for the troops). Many times, wounded soldiers are taken to field hospitals for treatment with little more than their battle dress uniforms (BDU's). That is why Akar Logistics® has developed the Transitional Care Pack™. It has been shown that these products do make a difference in helping soldiers with the stress of being wounded and knowing that their sacrifices are not in vain. The kit is designed in desert camo and is also small enough to travel with the wounded soldier to Landstuhl, Germany for further treatment and finally stateside.